Based on an original script by Elmore Leonard, Richard Fleischer's Mr. Majestyk is the best melon-picking movie I've ever seen. Charles Bronson stars as the titular character, a taciturn yet friendly man who is entirely focused on getting the watermelon crop on his 120-acre Colorado farm harvested in time. If you've ever been a farmer, or known a a farmer, or met a farmer, or encountered a farmer during harvest season, Mr. Majestyk's all-consuming attention to his crop will make perfect sense. If he doesn't harvest his crop on time, he stands to lose everything; not only his investment in time, money, and labor for that season but also, possibly, his entire farm. That's especially pertinent because it's only Vincent Majestyk's second crop since he bought his farm and planted his seeds. His need to bring in the crop takes priority over everything else in his life, and Elmore Leonard understands this. Nowadays Leonard, who passed away in 2013, is probably best known among movie fans for his gritty crime novels that served as the basis for titles like Jackie Brown, Get Shorty, and Out of Sight. (That's why I dove into his books and soon started devouring every one I could find.) But he began his career writing Westerns, telling New York Times in 1999 (via Smithsonian Magazine): "I chose Westerns as a way to get into writing. A way to learn how to write. Because there was soon to be a limitless market of better magazines, pulp magazines and I don't think you could help but sell." Leonard wrote a flurry of stories and novels, some of which were later adapted into the films 3:10 to Yuma, The Tall T, and Hombre. Later, Leonard said, "when the Western market disappeared because of television, I switched to crime, which I considered a very commercial genre, to continue to write." He published his first crime novel, The Big Bounce, in 1969, and that was quickly adapted into a film starring Ryan O'Neal. He followed that by adapting his own novel The Moonshine War and then penning the original script Joe Kidd for Clint Eastwood, released in July 1972. As to Mr. Majestyk, Leonard told Anthony May in 1991: "Originally, this story was meant for Clint Eastwood. He had called up and said he wanted something new. I had written Joe Kidd, an original, for him. It was shot but not yet released. And he called up and said, Dirty Harry is making a lot of money everywhere, but he only had a few points in it, I gathered. Now he wanted to own his next property. What he wanted really was another Dirty Harry but different. "And so I thought of Mr. Majestyk and I called him the next day and told him about a melon grower, just basically the situation, I'd just thought of it that minute. And he called back that night or rather just a little later that night and said he wasn't seeing him as a melon grower, rather an artichoke farmer because artichokes were grown not far from where he lived." Eastwood got busy with making High Plains Drifter and so producer Walter Mirisch boarded the project, bringing Charles Bronson on to star. Reportedly, the script featured cantaloupes, but they weren't in season when filming began and so watermelons were substituted. The script also had a different ending than what was filmed. Bronson, however, fit the role as though it were tailor-made for him. Leonard's plot turns are too good (and surprising) to spoil, so I'll just note that the narrative is extremely sturdy and showcases the farmer's restrained reactions to his continually unfair treatment, first by slimy young local and would-be tough guy Bobby Kopas (Paul Koslo) and then by a well-proven self-preservationist and highly-feared hitman Frank Renda, embodied by the superbly nasty and ferociously ugly (in his behavior) Al Lettieri who supplies the "murder" element of the picture. The film also benefits from the casting of Linda Cristal as fearless labor organizer Nancy Chavez and Lee Purcell as a woman named Wiley, whose on-the-button name is perhaps the only false note I heard. Local law enforcement is represented by Frank Maxwell, who made a series of appearances on nearly every TV show I watched in the 70s, usually as a cranky authority figure, while good-guy Alejandro Rey (yes, I first knew him from The Flying Nun) nobly embodies a loyal lieutenant to Mr. Majestyk. Director Richard Fleischer was a good and dependable craftsman who first came to notice in the 1950s with pictures like The Narrow Margin and Violent Saturday. His work in the 1970s included the surprising 10 Rillington Place, the excellent The Last Run, the very solid The New Centurions, my personal touchstone Soylent Green, and the pretty good mafia picture The Don Is Dead, leading up to Mr. Majestyk. Fleischer never calls attention to himself, yet his pictures are always very watchable, by which I mean they exhibit the mark of a professional who varied his shot selections, always maintained a solid pace, and featured very solid performances. That's certainly the case here; the action is brutal and straightforward when it needs to be, dialogue is delivered with a good snap, and the screen is constantly filled with life. 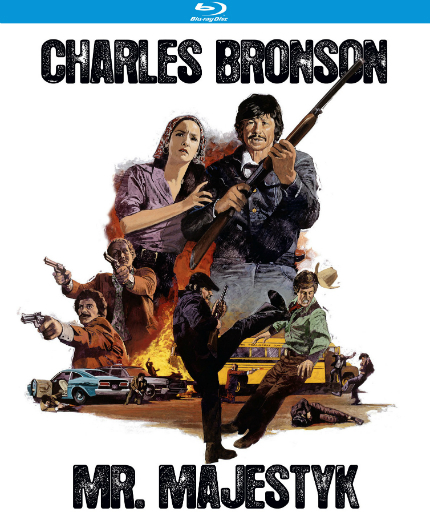 Over the past year or two, especially, I've enjoyed digging back into Charles Bronson's films from the 1970s, which was a remarkably fruitful era for the actor. 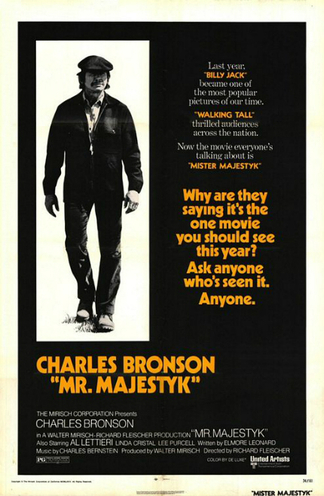 Released on July 17, 1974, Mr. Majestyk was quickly overshadowed by Death Wish, which hit theaters the following week. Though I remember a trailer and the poster for Mr. Majestyk, I never made any special effort to see it; I confess, the "melon picker" angle never appealed to me. Which may be why I enjoyed the movie when I watched it for the first time recently. On Blu-ray from Kino Lorber, the film, photographed by Richard Kline, looks quite good and pleasing to the eye. No extras are included, but it's definitely worth picking up if you're a fan of Bronson or the 70s. One reason for the film's modern relevance is that Majestyk hires Latino migrants to harvest his watermelons, which brings him into conflict with Bobby Kopas, who is so bold as to hire his own (local American) crew to work Majestyk's farm. The early scenes, especially, highlight the prejudices facing migrants, a subject that is close to my heart as a half-Mexican person whose mother worked in the Central California fields for several seasons along with her friends back in the day. This is not the main preoccupation of the film, though I think it's notable that it's included with no excuses accepted by Majestyk for the discrimination that surrounds him. He sets a good example of giving migrants an opportunity to prove themselves that resounds down to this day. 70s Rewind allows the writer to ruminate on his favorite film decade.